Fresh, hand-rolled sushi made by husband and wife team Kou and Christi. 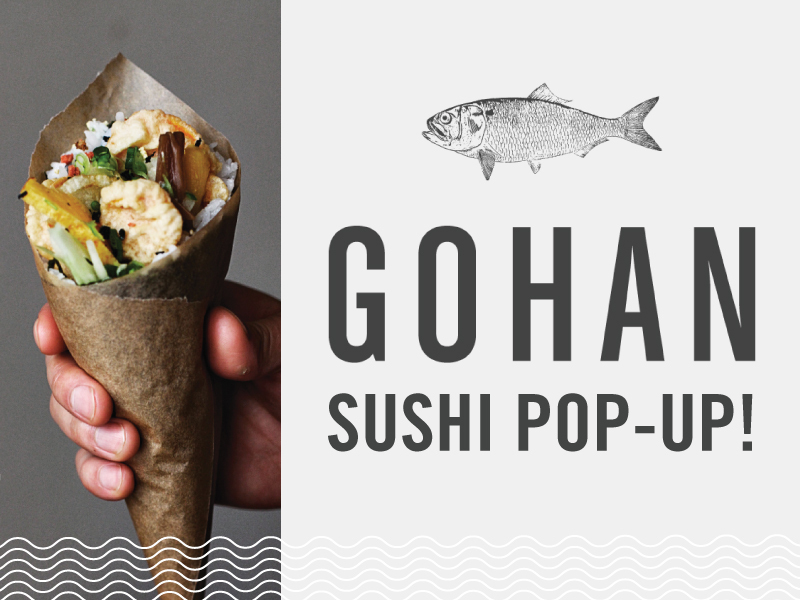 Their sushi is filled with seasonal, local ingredients, available exclusively at pop-up events around town. tuna, avocado, garlic, ginger, green onion, spicy sesame, chili threads. salmon, avocado, garlic, ginger, negi, spicy sesame, chili threads. shrimp, negi, masago, cucumber, tempura crisps, mayo, unagi sauce. house-cured salmon, scallions, local dilled chèvre, lingonberry sauce. crab salad, avocado, cucumber, masago, spicy mayonnaise. housemade local egg tamagoyaki, avocado, house-pickled daikon, carrots, cucumber, kampyo, sesame sauce. spicy tuna, cucumber, avocado, gobo, tempura crisps, unagi sauce.